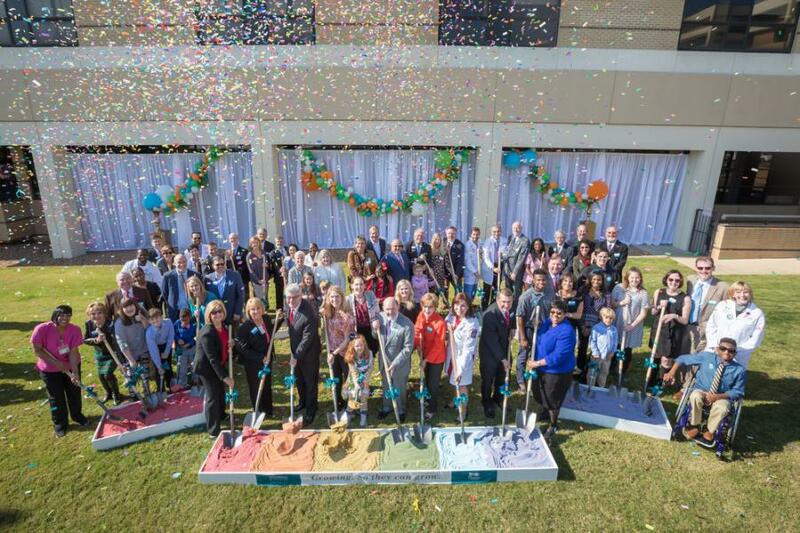 Patients and doctors were among those who turned out for the groundbreaking, which featured confetti, along with shovels dug into a rainbow of colored sand. 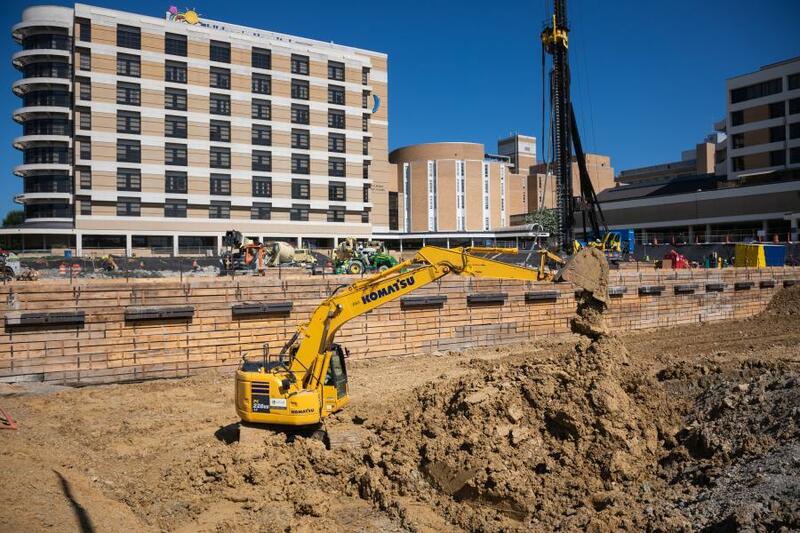 Scheduled to open its doors in 2020, a $180 million pediatrics tower is currently under construction at the University of Mississippi Medical Center (UMMC) in Jackson. In December of 2017, Gov. Phil Bryant and other officials broke ground on the seven-story, 340,000-sq.-ft. structure, which will include 88 private NICU rooms, additional pediatric intensive care rooms, 12 operating rooms, a children's imaging center and an outpatient pediatric specialty clinic. Being built adjacent to Batson Children's Hospital, the pediatrics tower is an essential addition to the campus. A new elevator lobby and public access corridor will tie into the existing tower. Batson Children's Hospital uses the imaging department of UMMC, which is a quarter-mile hallway walk away. The machines there are built for adults, and the décor is not child-friendly. Planning for the project began in 2016, the same year the Campaign for Children's of Mississippi was launched. The campaign is a $100 million philanthropic drive to help fund the construction. Children's of Mississippi is the umbrella organization that includes Batson, the state's only children's hospital, and all UMMC pediatric care. The campaign kicked off with a $10 million donation from Sanderson Farms CEO and board chairman Joe Sanderson Jr. and his wife, Kathy. The Sandersons are co-chairs of the Campaign for Children's of Mississippi, while New York Giants quarterback Eli Manning and his wife, Abby, serve as honorary co-chairs. The Mannings have pledged $1 million to the campaign, which has raised more than $64 million, to date. 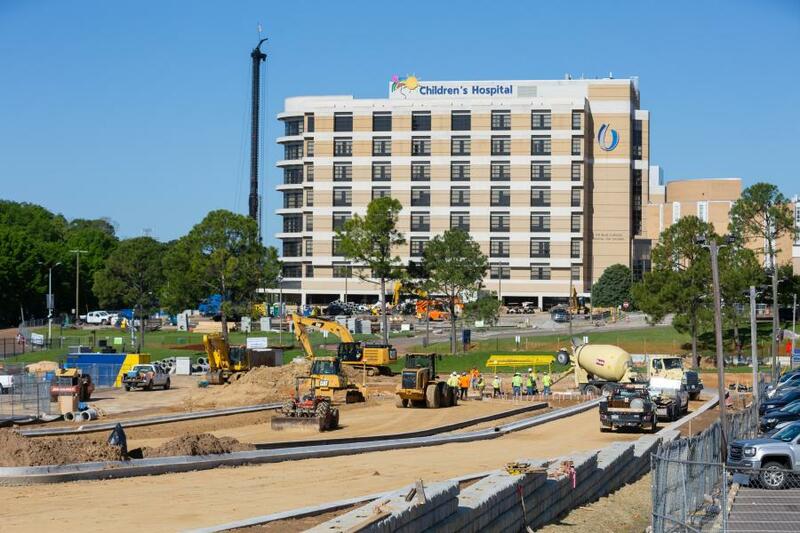 Children's of Mississippi leaders anticipate recruiting 30 to 40 new physicians in the next five years as the facility is built and after it's opened, since it will provide additional capacity. At a minimum, approximately 50 to 75 staff positions, not including doctors, would be added after construction. In 2017, UMMC won approval from the state College Board to borrow up to $91 million from outside sources to finance the expansion, and the University of Mississippi has agreed to lend up to $40 million from its own cash reserves. 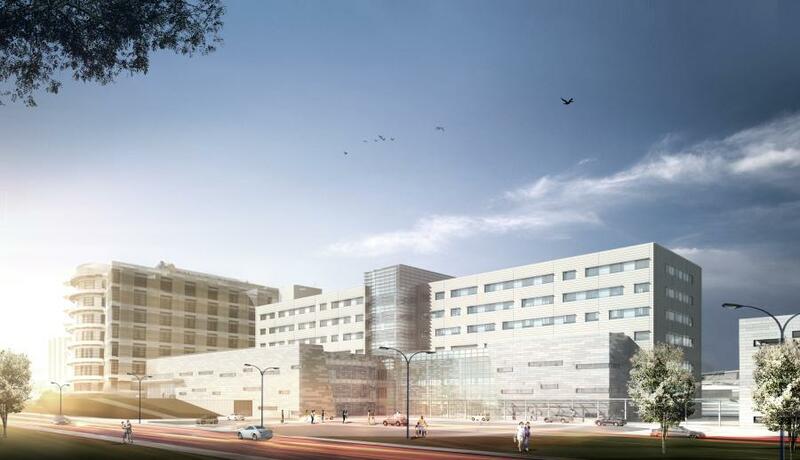 Medical Center officials say they may not need all that money, as they are planning to pay for construction in part with private donations and state bond funds. So far, more than $65 million has been raised toward the $100 million goal of the campaign. Children's of Mississippi serves patients from throughout Mississippi, according to Guy Giesecke, CEO of Children's of Mississippi. In fiscal year 2018, 9,850 children were treated as Batson Children's Hospital inpatients. Some 119,416 children visited Children's of Mississippi outpatient clinics, and 48,500 children were treated in the pediatric emergency department at Batson. Colorful windows will accent the façade of the hospital, while lobby hues will combine soothing neutral shades with bright pops of lime green, tangerine and turquoise. In the new imaging center, décor will help ease young patients' fears. MRI machines and the walls around them will feature playful designs and bright colors. Work began in February 2018, with completion scheduled for fall 2020. Currently, the project is in the mass excavation and auger cast foundation stage. The biggest concern is making certain that crews don't disrupt existing hospital services, in hopes of minimizing patient inconvenience during the building process. “A new entry drive has been installed to allow for the closure of Peachtree Street,” said Landon McCaskill, project manager with Brasfield & Gorrie, which serves as construction manager. Site demolition and clearing were required, as the tower is being built on two former parking lots. 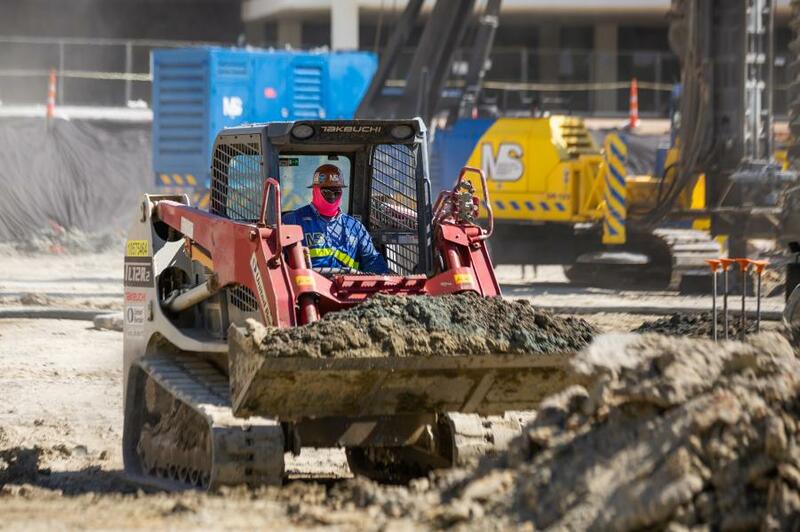 Equipment being used on the job includes: bulldozers, excavators, drilling rigs for foundations, graders, front end loaders, dump trucks, tower cranes, mobile cranes, scissor lifts and aerial lifts. Some of the main materials required to build the pediatric tower will include: concrete, rebar, steel, brick, metal panel, glass/curtainwall, drywall, sheet metal, copper wire and piping. About 50,000 cu. yd. of dirt is being moved on the project. Weather has not been a major issue, so far; however, rain and lightning have affected some site work and foundation drilling activities. Crews are hoping summer conditions won't take a dramatic turn as they move forward on the complex assignment. The project is not LEED, but is sustainability conscious. Mechanical systems include premium efficiency motors, VFDs on fan motors and pumps, high efficiency condensing boilers and variable primary heating water pumping arrangement for pump energy savings. In addition, LED light fixtures will be used for energy saving and longer life, along with energy efficient power transformers, automatic lighting control, daylight harvesting and a flywheel energy storage unit for longer life and reduced cooling. The project also calls for high-performance fritted exterior glazing, extended mullion caps for shading, low VOC paint and FSC certified wood components. Batson Children's Hospital treats patients from all 82 counties in Mississippi, and across the country, who are in need of medical care ranging from childhood illnesses to life-threatening trauma cases. It provides services in more than 30 specialty areas, including newborn medicine, pediatric cardiology, neurology and surgery. It houses the state's only pediatric intensive care unit and emergency department, along with Mississippi's only pediatric treatment programs for cancer, cystic fibrosis, sickle cell anemia and congenital heart defects.